Workers celebrate completion of the south tunnel portals. Edmonton Transit photo. Construction of Edmonton, Alberta’s eight-mile Valley Line LRT, begun in April 2016, is nearing the half-way point. The project involves two significant firsts for the city that is the province’s capital: It will be Edmonton's first low-floor LRT line; and the first built under the P3 (public-private partnership) method. 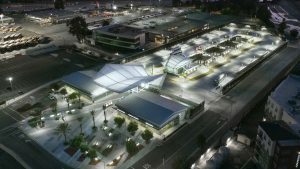 The Valley Line will link downtown Edmonton with the southeastern section of the city, terminating at a shopping mall, Mill Woods Town Centre. 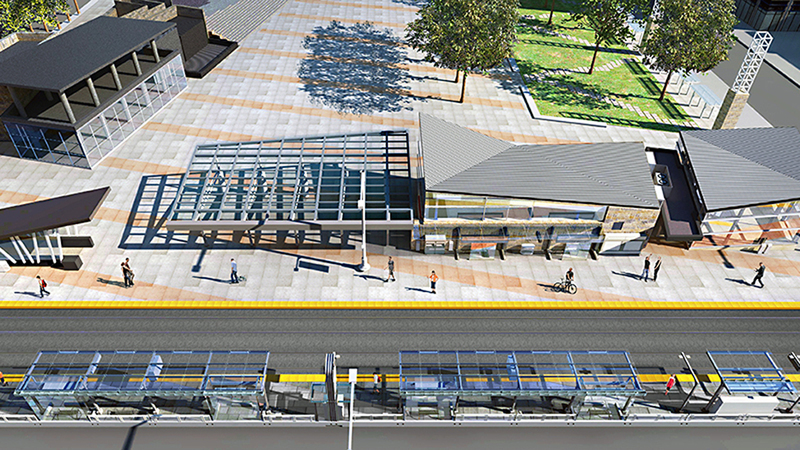 It represents a significant change from the existing high-platform system, as Edmonton has recognized that going low-floor offers significant economies in station construction, thus allowing simpler but more numerous stations. 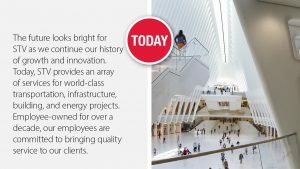 The selected consortium, TransEd, has partners that include Bombardier and EllisDon, a major construction firm. A tentative opening date of December 2020 has been announced. 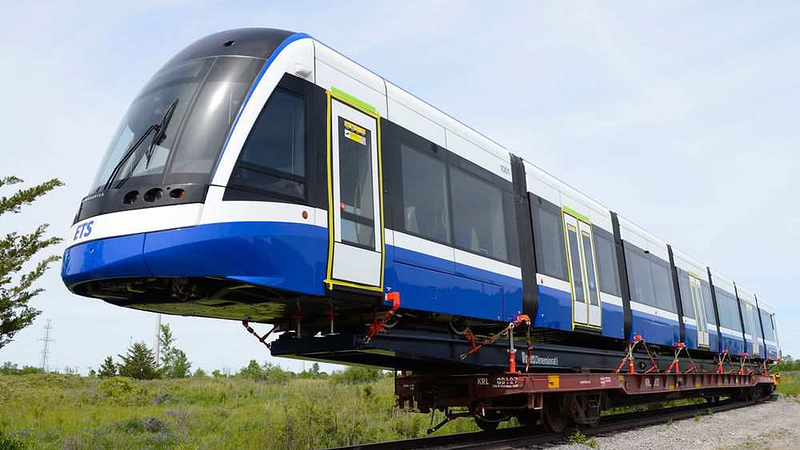 Twenty-six Bombardier Flexity seven-section articulated LRVs are on order; the first unit was en route by rail at press time. New seven-unit Bombardier Flexity low-floor LRV en route to Edmonton. Edmonton’s most recent LRT extensions involved a three-mile combination tunnel/center reservation route to a local college, the Northern Alberta Institute of Technology; and an approximately five-mile southerly extension to the original line, located chiefly in an existing median strip. Edmonton Transit opened its first LRT line, the Century Line, in 1978, three years before San Diego. 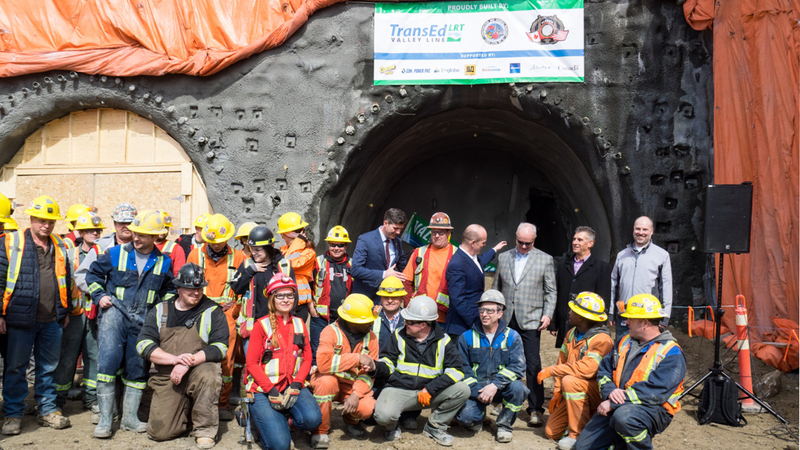 This premier route began in a tunnel downtown, then continued on the surface beside a CN line to Belvedere Station, about four miles out; a short extension to Clairview Station was completed within a couple of years. 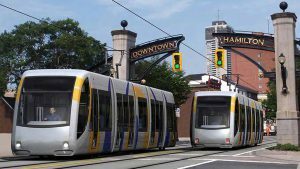 It was to be about 10 years, however, before further significant LRT construction began. 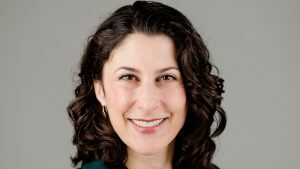 This was due, in part, to two factors: the high cost of the subway section, including stations; and lower-than-anticipated patronage. 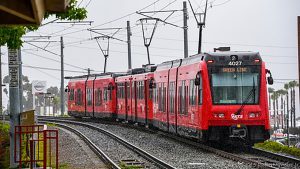 The latter situation seems to have been partially due to the decision to locate the line along a railway corridor, somewhat remote from established residential neighborhoods; and to slower-than-expected development near the Clairview terminal. Planners had made a decision to avoid using public roads—a policy that has subsequently been changed. Edmonton was also faced with significant unexpected costs when major expansion did get under way: Canadian Pacific refused to allow use of its bridge over the North Saskatchewan River, despite the presence of two existing streetcar decks, for the LRT, thus a new bridge was built; and the university insisted that the line be underground rather than on the surface through its campus. Work completed to date includes a 1,200-foot, double tunnel section downtown, taking the tracks to the vicinity of another new bridge across the North Saskatchewan River valley; tree, median and streetscape removals to permit right-of-way preparation; sub-surface utilities relocation; removal of the Cloverdale footbridge to make way for a new LRT and pedestrian bridge; and completion of piers for the elevated sections. The yard and shop facility has been completed to the point where it can receive vehicles as they arrive from the manufacturer. Retaining wall construction at Muttart Station, and at Connors Hill. Passenger connection to existing (Century Line) LRT at Churchill Station. Finishing work on twin tunnels. Casting of elevated span castings at Davies Station. Conversion of Bonnie Doon Traffic Circle to a standard intersection, to accommodate LRT. 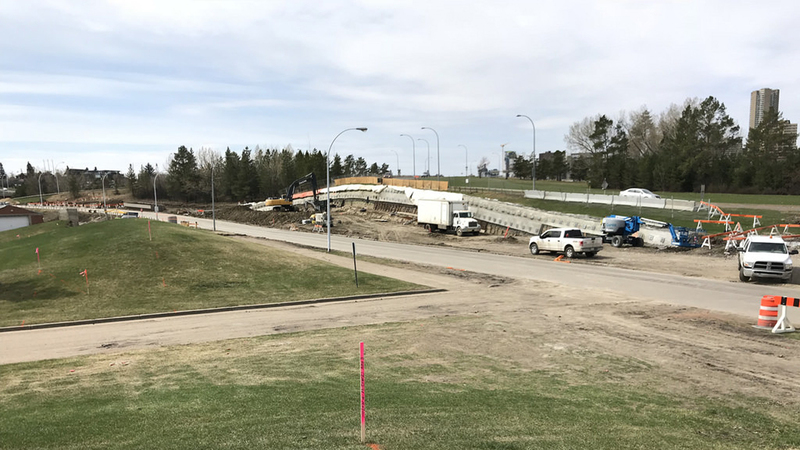 Installation of a noise abatement wall on 66 Street. Completion of the Gerry Wright Operations and Maintenance Facility. Piers south of the North Saskatchewan River Bridge. John Thompson photo. The Valley Line will be chiefly a surface operation, in or alongside arterial roads, and presumably involving ties and ballast track construction. However, there are three significant civil works to complete: the bridge over the North Saskatchewan River; a lengthy elevated section, including Davies Station, to pass over a major intersection, two railway lines, and a ravine; and a new bridge across a highway. Most of the trackage will be reserved. However some of the street operation will have rails that are flush with the pavement. 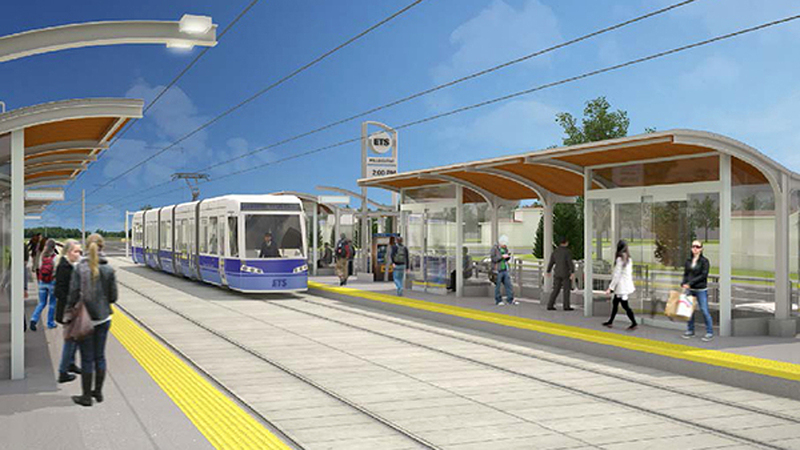 There will not be a physical track connection with the existing high-floor LRT system. 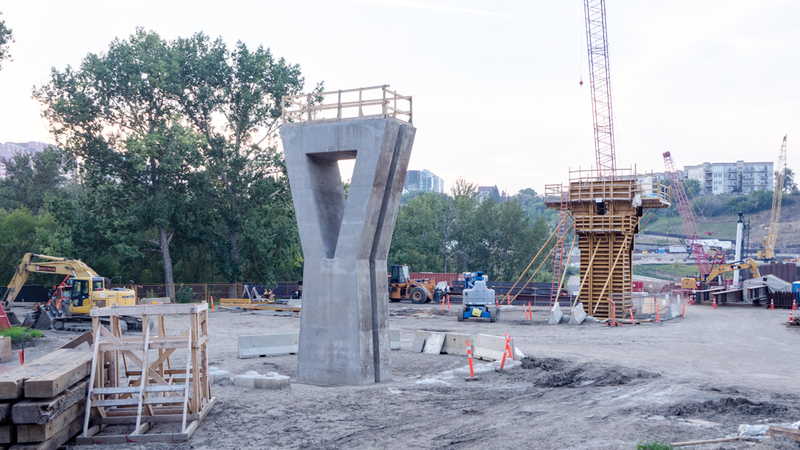 The Valley Line’s estimated cost, as of 2016, is C$1.8 billion, allocated as follows: City of Edmonton, C$800 million; Province of Alberta, C$600 million; Government of Canada, C$400 million. The Canadian Government, incidentally, has only recently become involved in a significant way in rapid transit financing. Retaining wall under construction at Muttart Station. John Thompson photo. The present undertaking is only Stage One of the total Valley Line project. Stage Two, which awaits final approval, will see LRT tracks extended to West Edmonton for the first time. The route will follow 102 Avenue, Stony Plain Road, 156 Street, and 87 Avenue to the Lewis Farms neighborhood. En route, West Edmonton Mall, one of the world’s largest, will be served. 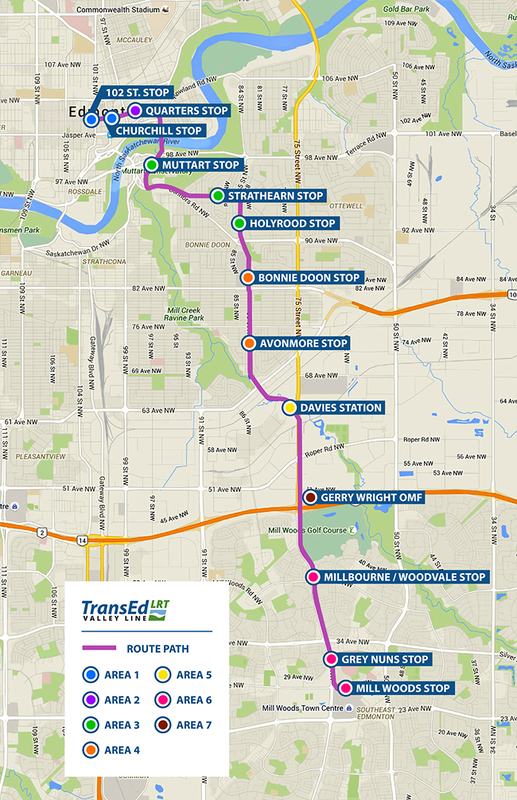 Edmonton’s long-term rapid transit plan also incorporates extensions to the high-floor lines.